Welcome to a supersized version of HT News! I have been busy out and about and so I am woefully behind on blogging and on seeing what good things are going on in the Historical Fiction blogiverse! Have you entered our giveaway for Lady Vernon and her Daughter, A novel of Jane Austen's Lady Susan by Jane Rubino and Caitlin Rubino-Bradway? We are giving away 10 copies so there is a good chance to win! See all the giveaway details in this post. There is another chance to win Lady Vernon and her Daughter at Historical-fiction.com. Ana and Alex both participate in another blog called Lights, Camera...History which focuses on period dramas. The blog has been in existence for two years, and so to celebrate, they are having a giveaway of a period drama DVD. The winner gets to choose from a selection of titles. Head over to Lights, Camera...History! to check out all the details. 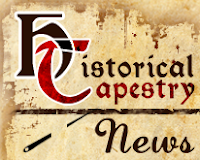 Sarah from Passages to the Past has posted Part 2 of the Visual Preview of the Spring season. Lots of fabulous historical fiction books to hear about! I always add lots of books to my TBR list when Sarah does these posts. Philippa Gregory has been interviewed by the LA Times about the Tudor smear campaign against the previous reigning family! Michelle Moran is still working the blogosphere. This time you can read an interview with her at Dolleygurl's blog, The Maiden's Court. 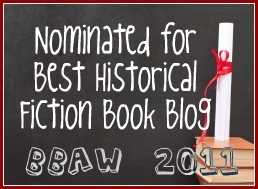 There's a new(ish) book challenge that historical fiction lovers might be interested in! Heidenkind's Art History Challenge started at the beginning of September, but I hadn't heard of it until now! Elizabeth Chadwick has shared news of book deals to publish some of her books in Hungary and Turkey. I can't imagine how cool it must be to be able to see your work being published in other languages! Do you like your historical fiction to have a gothic feel to it? If so you might be interested in the current giveaway over at Obsessed with Books. You have a chance to win a copy of Perfume by Patrick Suskind, The Historian by Elizabeth Kostova or Shadow of the Wind by Carlos Ruiz Zafon. Over at The Burton Review, there is a chance to win a copy of The Other Mr Darcy by Monica Fairview. Amy from Passages to the Past has a lot of giveaways on at the moment, and she has just announced another one, this time for Diane Haeger's The Queen's Mistake. Thanks for the mention Marg!! What a great post - there is so much going on!